Plantain 101: What Is A Plantain? 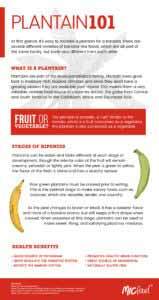 24 Oct Plantain 101: What Is A Plantain? At first sight, it’s easy to mistake a plantain for a banana. There are several different varieties of banana-like foods, which are all part of the same family, but taste very different from each other. Plantain trees grow best in moisture-rich, tropical climates and since they don’t have a growing season they are available year-round. This makes them a very valuable, reliable food source in countries across the globe from Central and South America to the Caribbean, Africa, and Southeast Asia. Plantains are part of the Musa paradisiaca family. So is The Plantain A Fruit or a Vegetable? 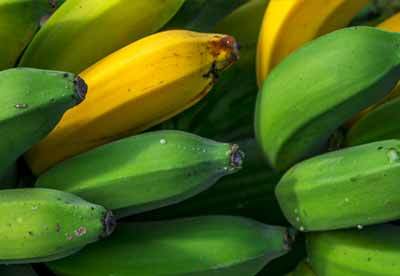 According to Fruit and Veggies – More Matters, the plantain is actually. . . a fruit! Similar to the tomato, which is a fruit consumed as a vegetable, the plantain is also consumed as a vegetable. Unlike the banana, plantains must be cooked prior to eating. There are many ways to consume the plantain – it can be steamed, boiled, grilled, baked or fried. They are starchier and lower in sugar than bananas which makes them much more versatile as a cooking ingredient. They are often utilized in a meal just as one would a starchy vegetable (potatoes, for example) depending on the stage of ripeness. Plantains can be eaten and taste different at each stage of development, though the interior color of the fruit will remain creamy, yellowish or lightly pink. When the peel is green to yellow, the flavor of the flesh is bland and has a starchy texture. Raw green plantains must be cooked prior to eating. This is the optimal stage to make savory foods such as tostones, which are versatile, tender, and crunchy. As the peel changes to brown or black, it has a sweeter flavor and more of a banana aroma, but still keeps a firm shape when cooked. When prepared at this stage, plantains can be used to make sweet, filling, and satisfying platanos maduros. Traditionally, plantains must be peeled, sliced, and cooked prior to consuming. Here at MIC Food® we are helping chefs, restaurants, industrial kitchens, retail brands, delis, and others in the food industry rethink their menus and increase appeal among ethnic and mainstream consumers alike. 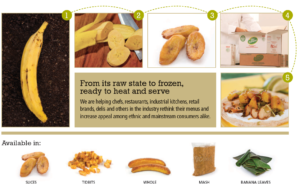 We provide variety of plantain products that come peeled and cut, ready-to-heat and serve, saving you hours of prep time so you can focus on what matters the most: making every meal memorable. Ask Our Chef about how you can incorporate plantains into your menu! Or read up on our Big Banana® brand to find which product best suits you. Hungry for more? Check out our recipe library which highlights how versatile plantains are.